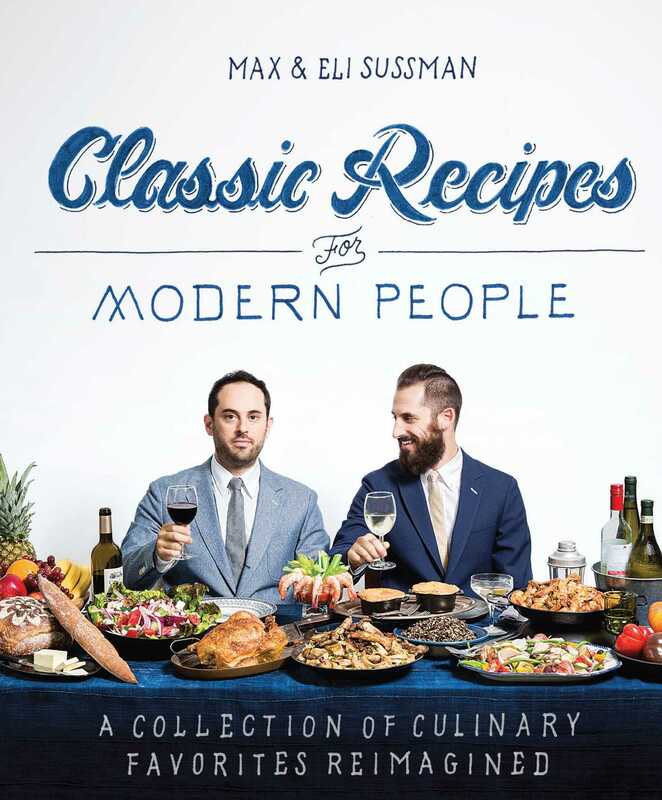 Chef brothers Max and Eli Sussman are back with their fourth cookbook, Classic Recipes for Modern People, featuring over 75 recipes that reimagine classic dishes from their childhood and yours, with a little humor baked in along the way. Divided into eight sections like “Classics from Our Childhood,” TV Dinner Classics,” “Future Classics,” and “Breakfast Classics” readers will find reinvented dishes inspired by Max and Eli’s childhood in Detroit, the frozen food aisle, followers on social media, and more. Everything old is new again - tastier, bolder, and better. Welcome to the new classics. 1. To make the brisket, cut the meat into 1-inch (2.5-cm) pieces. In a wide pot, heat the olive oil over high heat. When the oil is very hot, add the brisket and a pinch of salt and cook, stirring, until browned, about 5 minutes. Reduce the heat to medium, add the onion, and sauté until softened and caramelized, about 7 minutes. Add the garlic, brown sugar, and tomato paste and sauté for 3—4 minutes. Add the stock and red pepper flakes and bring to a simmer. Reduce the heat to low, cover, and simmer until the meat is falling apart and tender, 2—3 hours. Add water if the pan begins to dry. The meat should be just barely covered with liquid when it is ready. If there is too much liquid at the end, transfer the liquid to a small saucepan and simmer until reduced. 2. To make the corn bread, preheat the oven to 375°F (190°C). Line a 9-inch (23-cm) square baking pan with parchment paper and spray with olive oil. 3. In a large bowl, stir together the cornmeal, flour, baking powder, salt, brown sugar, chiles, and green onions. In another bowl, whisk together the milk, yogurt, and olive oil. Add the milk mixture to the cornmeal mixture and fold just until the batter is blended; it will be slightly lumpy. Add the egg and fold until blended. 4. Pour the batter into the prepared pan. Bake until the bread is golden brown and a toothpick inserted into the center comes out clean, about 20 minutes. Transfer the pan to a wire rack and let cool completely. 5. Meanwhile, in a heavy frying pan, heat the olive oil over high heat. Add the onion and cook, turning once, until deeply caramelized, about 4 minutes on each side. Transfer to a cutting board and cut into 1⁄2-inch (12-mm) pieces. 6. Cut the corn bread into 4 equal pieces, then halve each piece horizontally. Place one-fourth of the braised beef on the cut side of a bottom piece of corn bread. Top with 1 tablespoon of the onion, a slice of cheese, and then the top piece of corn bread, cut side down. Repeat to make 3 more sandwiches. In a large nonstick frying pan, melt about 1 tablespoon butter over medium heat. Working in batches, fry the sandwiches, turning once and adding butter as needed, until the bread is browned and the cheese is melted, about 3 minutes on each side. Serve right away. "The cookbook displays their trademark creative spin on classic dishes, featuring recipes for things like Gefilte Fish Terrine, Duck a` l’Orange, and Kibbeh and Tzatziki. It’s decidedly not kosher (see: Pork Burger with Apple Ketchup, Shellfish Shells), but it speaks to the contemporary trend of repurposing traditional Jewish foods to make them shine in a modern context."